You need a solid writing app. It’s vital for practically every kind of company—whether it’s for drafting contracts, writing up website content, or just putting together internal documentation. But team collaboration can easily become a huge nuisance. The more people involved, the more difficult it can be to decide on the right edits and produce a coherent piece. That means the last thing you want is even more trouble dealing with a collaboration tool that doesn’t fit your workflow. We delved into the features of three popular collaborative writing apps—Quip, Microsoft Word, and Google Docs—to help you decide upon which is best for your team. 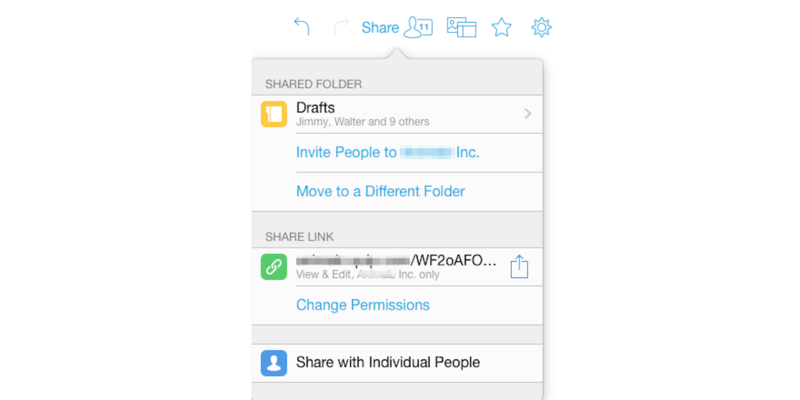 The ability to share documents is step one in any collaborative writing app. It’s how you get the document you’re working on distributed to your team so they can contribute and make edits. Let’s see how frictionless these programs make the process. Quip is built for teams, so you can’t even sign up for the app without starting a shared team folder (you can always add or remove people from a team later). You can set up a directory for your team that is organized through a folder system. You can create documents in the directory or place them in folders. Any document that you create in the shared directory is automatically accessible to your team. You can also restrict access to folders for just one or multiple team members or make a folder private altogether. 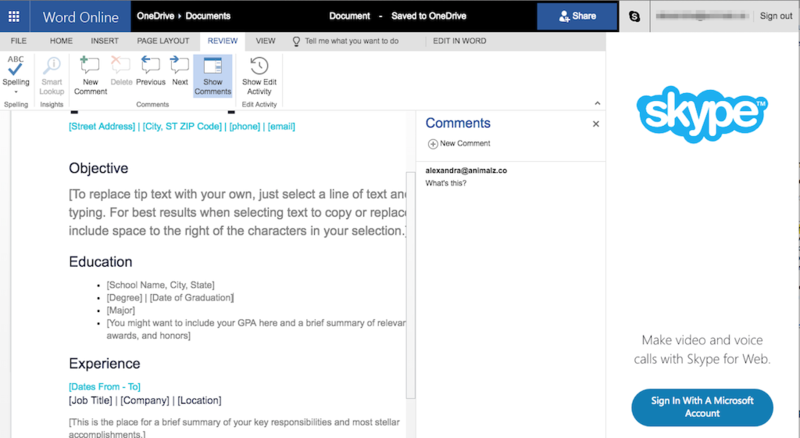 Each document also gives you the option of sharing with individuals outside your team, or sharing the document “externally”—which means anyone with a Quip link can view or edit it. Microsoft Word has a different workflow since the program’s focus is to be easily accessible and sent online. A document is private and saved onto your OneDrive automatically. To share a document you use a share button called “Share with People.” You send users access to the document and then set permissions to “viewing” or “editing.” Alternatively, you can just send a link and make access to the document public, or just for anyone with the link. 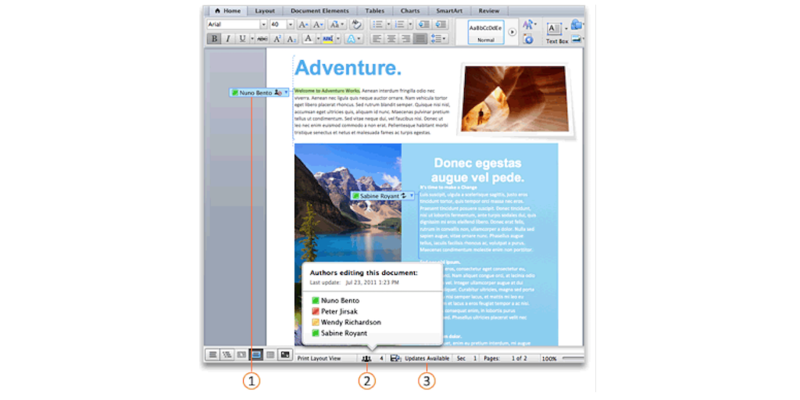 On the receiving end, a user needs a Microsoft Office account to open, view, and edit the document. Google Docs sharing features function similarly to Microsoft Word’s. Without even a save button, every document is automatically saved to Google Drive. To share with your team, you click a “share” button. 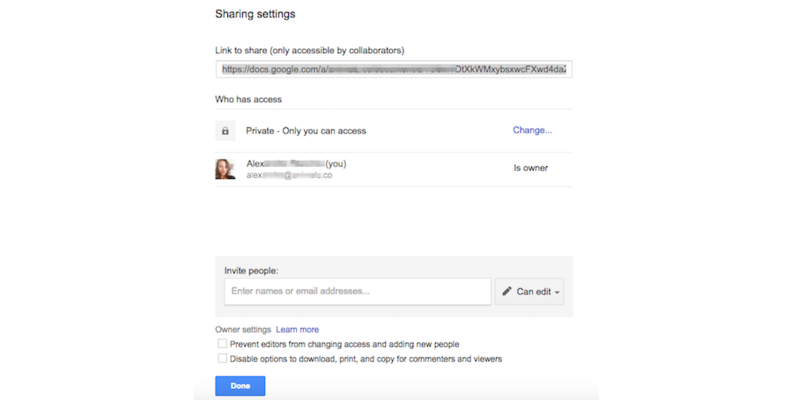 From there, you can either invite collaborators or grab a shareable link. Where it differs from Microsoft Word is that it has more permissions you can set. You can enable collaborators to have viewing, commenting, or editing permissions. You can also prevent collaborators from downloading and printing the document. Similar to Microsoft Office, recipients of your document need to have a Google account to see and interact with the document. The need to customize the permissions for each shared document causes a lot of friction and back-and-forths. If you send a document in Google Docs or Microsoft Word and forget to set the right sharing options, your collaborator has to send a request and then get your approval via email. 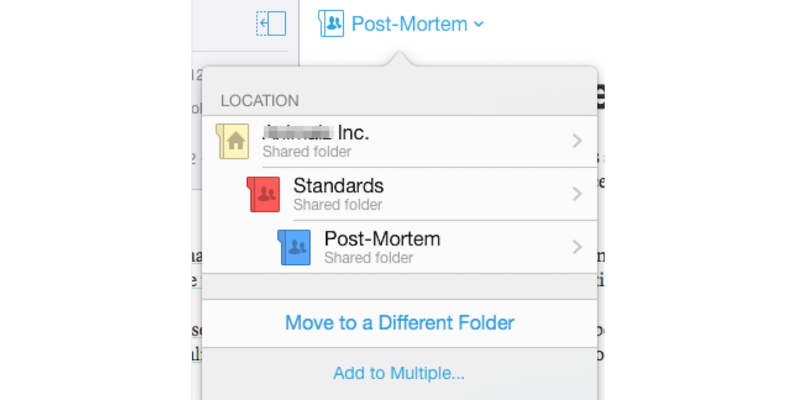 Quip eliminates the need for this messy back-and-forth with its default being sharing mode. In certain situations, team members need to be able to work on the same document in real time, without any glitches or hiccups. Of course, two people can’t be editing the same line or word at the same time, so each of the three programs addresses this use-case differently. The only minus is that if a user isn’t actively making changes to the document, collaborators can’t immediately tell who’s viewing or working on the document. Microsoft Word uses a color-coded system, where each person is tagged next to the paragraph they’re editing. While you “take over” access, you do have the option of accepting or rejecting their changes, if you so choose. The big advantage here is that the creator of the document has the ultimate say over what changes are applied. Unlike with Quip, at the bottom of the document, you can see how many people the document was shared with and how many of those people are editing the document. Google Docs also uses color-code tags, but it shows you where in a document each collaborator is working, down to the word. It doesn’t lock any portion of the document and lets multiple authors work on the same line. Similar to Microsoft Word, Google Docs lets you know with whom the document was shared and who is currently working on it with you. While the other two programs can lock collaborators out of certain parts of the document, Google Docs enables any amount of people to be working on any one section of the document. The unfortunate truth is that when too many people work on a project, it can get sloppy. One person might write something that the rest of the team doesn’t agree with, or someone might delete an essential clause to the document. Enter Revision History. Let’s take a look at how easy it is to revert changes in these apps. Quip has a handy sidebar that keeps track of all changes and edits. 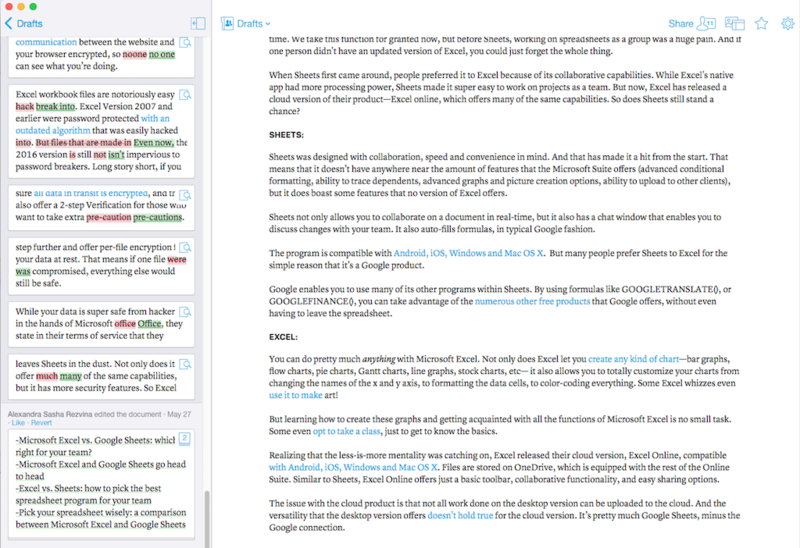 The edits are grouped by user and are collapsible, so you can easily look back at any point in the document’s history. Quip also has a “view revision history” button for each paragraph. When things get moved around a lot, this feature isn’t super useful, but it can make a big difference for small tweaks and edits. Microsoft Word doesn’t have as many options as Quip, but it does have something called version history. This feature lets you revert to versions of the document before a collaborator made his or her edits. The version history is extremely basic when compared to Quip’s revision history, only letting you revert to one version per editing period. 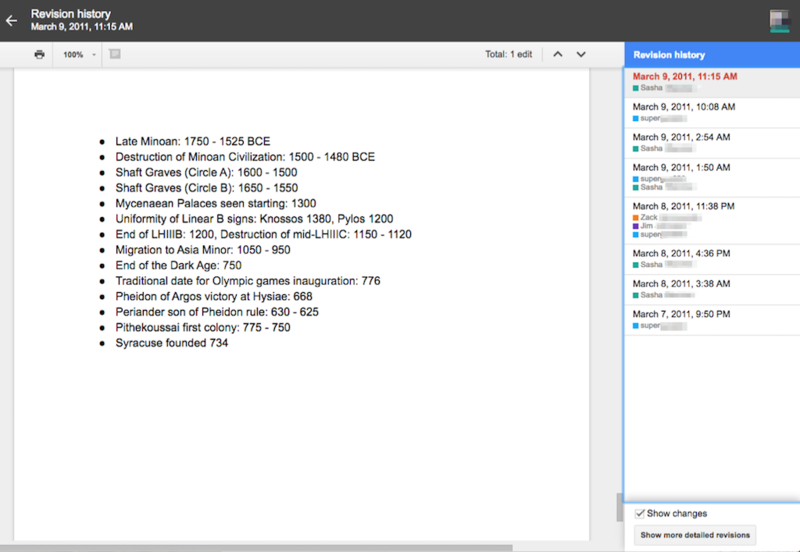 Google Docs lets you open up a “Revision history” sidebar. You either view the changes made based on the collaborator, or you can select “Show more detailed revisions,” which enables you to break down the versions to the minute. You have the option of reverting back to any minute in the document’s history. Quip! Google Docs was a close second, with the ability to revert back to any minute change. Quip’s ability to look through the edits in the sidebar, however, is a game-changer. You can compare different versions of the same paragraph just by clicking through the edits. Also, if a new collaborator joins a project, they can see the entire history of the document and don’t need to be filled in about how it developed. Communicating with your co-workers about projects is one of the most important aspects of collaborative writing. You need to not only be able to suggest changes and edits, but you have to be able to discuss the piece as whole and in which direction you want the team to take it. Quip takes communication very seriously. For one, it has an in-line commenting function. Once addressed, a writer can “archive” the message, which deletes the note from the main section but preserves it in the history sidebar. Quip also allows you to chat in the sidebar and lets you use @mentions to get a coworker’s attention in the document. Lastly, you can set up Quip to send push notifications to your desktop and your phone for any time someone opens a certain document or mentions your name. Microsoft Word also has a basic commenting feature, that lets you leave comments with or without an anchor text (it doesn’t keep the beloved “track edits” feature of the original native program). It also has an integration with Skype that enables you to chat using your Microsoft account. This results in a stacking of two sidebars that somewhat limits that amount of visibility on the actual document you’re working on. With Google Docs, you have the ability to leave comments that have an anchor text, but no comments that stand alone. It also has a “+ mention” similar to Quip’s “@mention,” enabling you to speak to a collaborator directly. As mentioned, you need permission to leave comments before you can do these things. 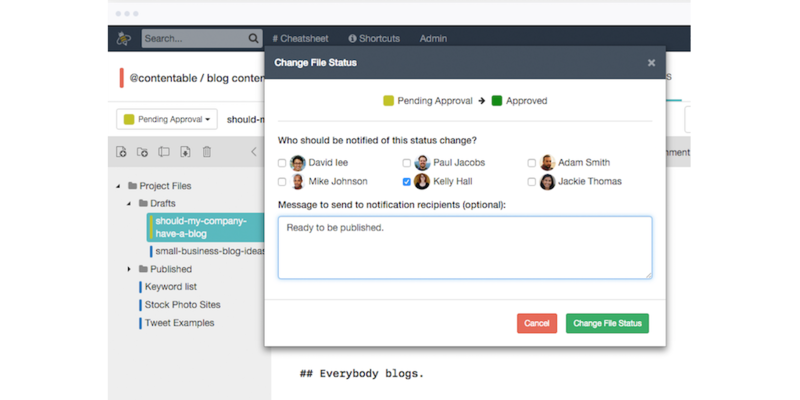 If a collaborator addresses the comment, they can hit “Resolve” or reply to your comment. Unlike Word and Quip, Docs doesn’t have an IM option. While all the programs let you leave comments and mark up the document, Quip provides the most channels for communication between collaborators. Between inline comments, document comments, @mentions, and the chatroom (available in the directory and in the sidebar for individual documents), you won’t have any trouble communicating with your co-workers. Having tons of documents shared with different groups of people can easily become unwieldy, especially if every person has a hand in naming and organizing the files. An important feature for collaboration is the ability to find and access documents as quickly as possible. Quip’s main database is organized by files that can be color-coded. You have the option of viewing these documents as icons or in list-view. Each document also has a handy drop-down menu that shows you its breadcrumb trail. Beyond that, there is a search function that enables you to search by the title and contents of your documents. And it keeps a record of recently opened and edited documents on the home screen. While you can organize documents that you personally created by folder, there’s no easy way to keep shared documents organized. The best way to access a document is to search OneDrive for it. Word also keeps track of recently edited documents and even provides a bit of meta-data such as modification date and collaborator name. Google Docs has a very similar system of organizing their documents to Microsoft Word. They also let you easily organize the documents you created, but in order to get your shared documents organized, you have to add them to your drive which can get messy quickly. Like Microsoft Word, they also have a recent history section where they can easily access documents that they were recently working on. With both Google Docs and Microsoft Word, you often have to use a search bar to locate a document (unless you go through the process of saving everything to your own drive every time). This can really slow the process—especially if you don’t remember the name of the document or who created it. 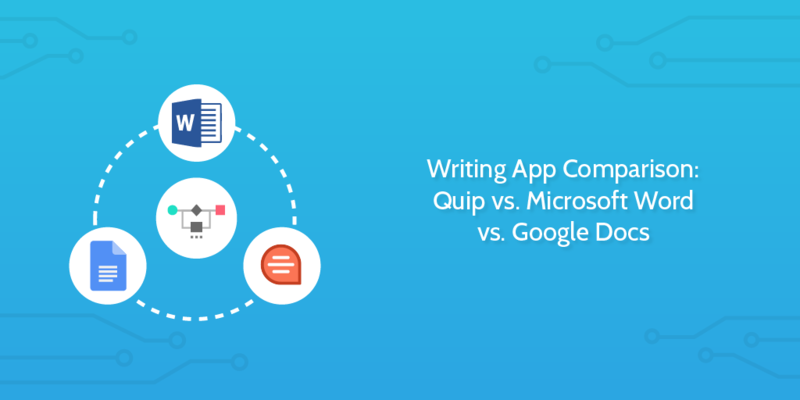 While Google Docs has extensive options in its toolbar and Microsoft Word has a lot of great formatting features, Quip is designed with collaboration and communication in mind. Its interface is super easy to use, and it serves as a centralized location for all company docs. If a frictionless experience is your focus, and you don’t want to fuss over formatting, Quip is, by far, the best option. While Docs, Word, and Quip suit the purposes of most collaborative environments, many specialized roles require a different type of functionality. For those of you who fit a smaller niche, we threw in some bonus apps. 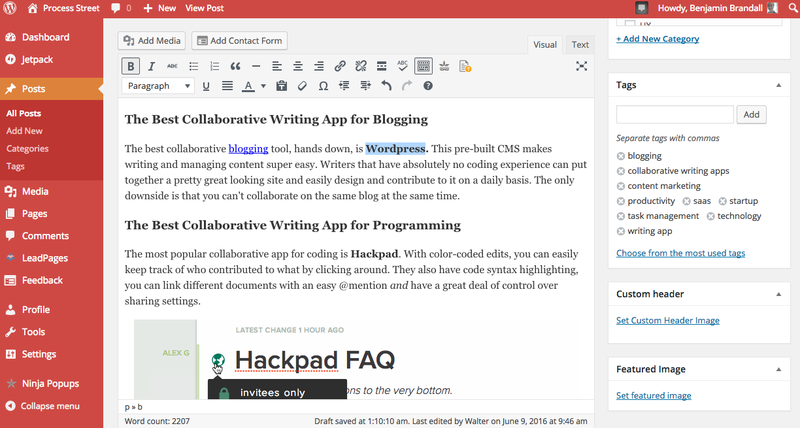 The best collaborative blogging tool, hands down, is WordPress. This pre-built CMS makes writing and managing content super easy. Writers that have absolutely no coding experience can put together a pretty great looking site and easily design and contribute to it on a daily basis. The only downside is that you can’t collaborate on the same blog at the same time. The most popular collaborative app for coding is Hackpad. With color-coded edits, you can easily keep track of who contributed to what by clicking around. They also have code syntax highlighting, you can link different documents with an easy @mention and have a great deal of control over sharing settings. For those that are publishing and editing web content often, Beegit is probably your best bet. It takes all friction out of having to transfer your content out of a collaboration tool and into a CMS. If you’re used to using markdown for writing — but long for the functionality in Google Docs, Word, and Quip — Beegit is your best shot. We’d love to hear about the different ways you use different collaborative writing apps in the comments. Who knows? You may even get featured in an upcoming article on Process Street! I hadn’t seen Quip before and it looks like it has a free level. Might give it a try. Also, Copyhackers (Joanna Wiebe) is working on one they will call Air, I believe. I look forward to trying that. It’s easy to see why you’d choose quip. But if you sacrifice quality, precision and professional appearance for the sake of “collaboration” then you’re guilty of producing a second-class document. It’s also a fact that the more hands are editors, the worse the quality. There is a reason why there’s only a handful of editors in a building full of writers…. the team should be able to proof and make SUGGESTIONS but never change editing that the author has down. I’m speaking of 30 years of professional work. I speak 6 languages, including Latin. I hold advanced degrees also, so I might know a thing or two about producing quality documentation. Companies are obsessed with “collaborating” on things, which interferes with the actual SME who is driving a particular task or effort. Leave the work to the people who know best how to do it… we can’t all be experts… and as such, any collaboration should be limited in scope to proofing, suggestions, and questions. Also, the grandfather of word processors, Word, is STILL the champ as it allows you to actually do more things in the actual document than a web app… there’s far fewer options available as opposed to all the commands at your disposal in Word. And… then there’s the pricing. Hmmmm…. pay a one-time license fee, or continually bleed money paying a monthly subscription…. companies are hoping and banking on the younger people (who don’t know any better) to think a monthly subscription is the way to go (yes, it is for the software company for sure! ).